Where to begin? As this blog develops, specific advice on relevant topics will be added on a regular basis. If you have comments or questions on a particular aspect of health care, please enter them below. In the meantime, start now by educating yourself and stockpiling your medical kit with inexpensive over-the-counter medications and equipment. How will you know what to get and how to effectively use your supplies? One place to start is with my recently released book, 101 Ways to Save Money on Health Care. You don’t even have to buy it – just check it out from your local library. Although the book was written with economics in mind, since knowing how to care for your own health is an important aspect of both Armageddon Medicine and saving money on health care, this is an inexpensive and timely starting place. It explains how to treat over 30 common medical conditions, often without consulting a professional. Under $10 at Amazon and on Kindle. Free at your local public library. This entry was posted in 101 Ways / Health Care, 101 Ways to Save Money on Health Care, Ankle sprain, Arthritis, Back sprain, Blood pressure meds, Books, Bookshelf, Chronic diseases, Diabetes Mellitus Type II, Diseases, Immunization, Injuries, Lacerations, Medications, OTC Pain meds, Over-the-counter meds, Perennial Favorites, Preparation, Prescription Medications, Save Money, Slide show, Sprains, Stockpiling medical supplies, Stockpiling medications, Vaccination and tagged Conditions and Diseases, Health, Health care. Bookmark the permalink. 4 Responses to Where to begin? Much has been written about stockpiling prescription meds especially antibiotics, but what over- the-counter medications would you recommend someone stockpile for use after a societal collapse? I can think of several but was hoping to get an experts advice. Great question, Kev. This deserves a detailed answer, which I hope to post later this week. 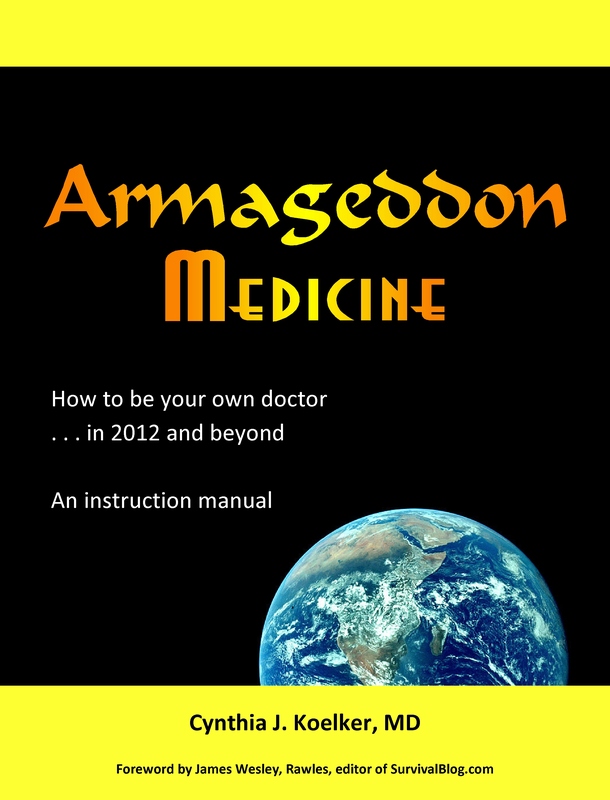 More coming in future articles, and my upcoming book, Armageddon Medicine.